On Monday at 5PM PDT, protesters at San Francisco’s Civic Center BART station prompted the closure of one of the city’s busiest transit stations, after an unpermitted march drew large crowds. 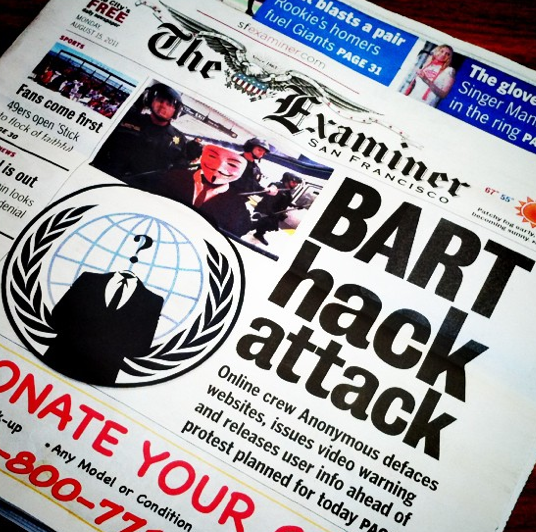 The civil action was been organized by Anonymous, the hacktivist group who yesterday released the names of several thousand BART passengers, after hacking into myBART, an independent community site that uses BART’s API. The protests were in retaliation to BART’s shutdown of cell phone service Thursday night at some of its stations, to disrupt planned demonstrations over a police shooting. The move by BART officials drew widespread condemnation, and prompted several groups to claim that the action was similar to Egypt’s former president Hosni Mubarak, who throttled Internet access to limit the spread of a pro-democracy movement in his country. The Twitter hashtag #MuBARTek has been used for the event. The initial protests were in response to the July 3rd shooting death of a homeless man on the platform at the Civic Center station, as well, as the shooting death of Oscar Grant by BART police. There are a couple of live video feeds, one from ABC Local and another from blogger Octavio Lopez Raygoza which we’ve embedded below, both highly recommended. Flickr feed for the protest is #Mubartek. Image Credit - Steve Rhodes. Click image for Source. Image Credit - sfSlim. Click image for source. Update: Member of the mainstream press, such as Nick Bilton of The New York Times, were calling the protest over by 6:30 pm PDT. All BART stations affected by the protest march have resumed their normal operation.